Maintaining a WordPress website is a never-ending process. Even after you’ve built your site, you’ll likely continue to make changes and adjustments indefinitely. This means you need to find a way to test those changes without negatively impacting your site or its visitors. Often, the best way to do this is to create a staging site. Also known as a testing or development site, this is a standalone copy of your website. You can use this copy to try out new themes and plugins, test bug fixes, and plan out changes well before implementing them on your live site. In this article, we’ll explain everything you need to know about staging sites, including why they’re so useful and how to create one. We’ll also provide some tips on how to use your new staging website effectively. When you create a regular website, one of the first things you’ll typically do is choose a domain and settle on a hosting plan. These steps are necessary for getting your site online so that people can visit it through their browsers. The result is often referred to as a ‘live’ or ‘public’ site. A staging website is similar in many ways to a live site, but its purpose is very different. Staging sites are private — not intended for just anyone to visit. They’re used as a tool for experimenting and testing. For that reason, they’re also frequently called ‘testing’ or ‘development’ sites. There are two primary forms a staging site can take. It can be an entirely new, blank website, or a carbon copy of an existing one. Both types have many uses, which we’ll discuss shortly. It’s also worth bearing in mind that a staging site can be completely offline and stored on a local computer, or hosted online but marked as private. Staging sites are very beneficial, but chances are you won’t want anyone else to be able to find them. You can build a new website, then design and tweak it until it’s perfect — all while keeping it private. Then, you can make it (or a copy of it) live when the time is right. Staging sites are the perfect playground for learning about the WordPress platform. You can use them to try out new plugins and themes, experiment with custom code, and so on. If your staging site is a copy of your live site, it’s the perfect place for bug-fixing and testing solutions to any errors that are giving you trouble. Of course, all of these things can be done on a live website. However, that’s a risky proposition. If you try out a new plugin or test a bug fix on your public site, you risk breaking something in the process. You could also end up slowing down your site temporarily, causing downtime, or otherwise interfering with your visitors’ experience. That’s why a staging site is so valuable. It helps you ensure that everything is working properly before making any changes to your live site. Plus, it lets you make sure a new site is completely ready to go before anyone can find it. For these reasons and more, having at least one staging site handy is important for nearly every WordPress website owner. Unless you plan to never make any changes to your site (which we don’t recommend), it’s well worth knowing how to use this valuable tool. Putting your staging site together can be easy or complicated depending on what method you use, and whether you’re creating a new site or copying an existing one. Below, we’ll present two of the best ways to get the job done. We suggest reading through each one, then picking the technique that’s most suited to your needs. Before moving on, however, this is the time to make a backup of your website if you don’t have one ready. Creating a staging site shouldn’t impact your live site in any way, but it doesn’t hurt to be careful. Perhaps the most convenient way to create a staging website is to do it through your existing web host. After all, you’ve already set up at least one site with your host, so you’re familiar with how the process works. While the resulting site will be online, you can still ensure it’s private and won’t be confused with your live site. Plus, it will usually be simple to make your staging site a copy of the live version. If your web host offers this option, there’s really no downside to using it. The process of creating a staging site this way will depend on what tools your particular host offers. Your best bet is to contact them for help or check our their documentation. Of course, if you have a hosting plan here at DreamHost, we can show you exactly how to create a staging site. Let’s walk through what the process will look like for users of our Unlimited Shared plan. Our shared hosting plans are an affordable yet powerful option for your WordPress site. You’ll get top-notch performance, pre-installed WordPress installations, and even a free domain. Most importantly for our purposes here, the Unlimited plan can be used to create as many sites as you’d like. What you’ll need to do is use one of your allotted websites as a staging site. To do that, you’ll have to create a temporary domain to host your staging site on. The simplest method is to create a subdomain. First, visit your control panel and navigate to Domains > Manage Domains. You should see your current domains listed there already. Click on the Add Hosting to a Domain / Sub-Domain button. Then, you’ll need to create a subdomain to use for your staging site. A subdomain enables you to keep your staging site on a separate install from your live site, so both can run independently. For example, your subdomain might be called staging.mysite.com. When you’ve chosen a name for your subdomain, scroll down and select Fully host this domain. You’ll be presented with a success message, and your new domain will be listed at the top of the screen. You may need to wait up to five minutes for the domain to be fully set up. When it’s ready, you’ll receive an email at the address connected to your account. There will be a link in that email to finalize the installation by setting up the password for your new site. Go ahead and do that now. At this point, your staging site is all set up. Don’t have a shared hosting plan? 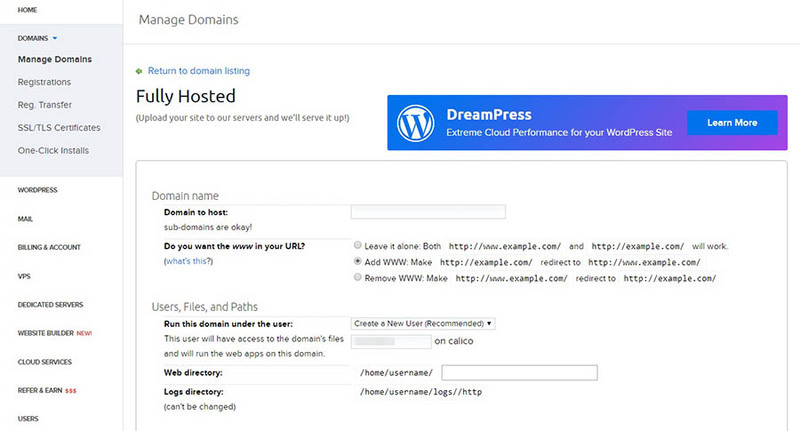 DreamPress Pro users can submit a ticket to DreamHost support, and our team will add a staging site to your account. To add a DreamPress subdomain, you just need to be sure that the name you pick ends in dream.press. For example, you could call your staging site mysite.dream.press. If you can’t create a staging site through your web host (or you don’t want to for whatever reason), there’s another option. You can use a dedicated plugin to get the job done. Depending on the plugin you choose, the process of creating your staging site will be simplified to some extent, although you may not get as many options for working with it as you would through your hosting provider. There are a lot of plugins that are either designed for this task specifically or include it as one of their features. We’d recommend taking a look at WP Staging, which is one of the most straightforward and targeted solutions you can find. This plugin makes it easy to create a clone of your live site, which will be saved in a subfolder of the main installation. What’s more, you won’t need any technical know-how to make it work. For a similar solution with more options, you can check out the premium plugin WP Stagecoach. Among other things, it makes pushing your changes from your staging site to your live site a breeze. 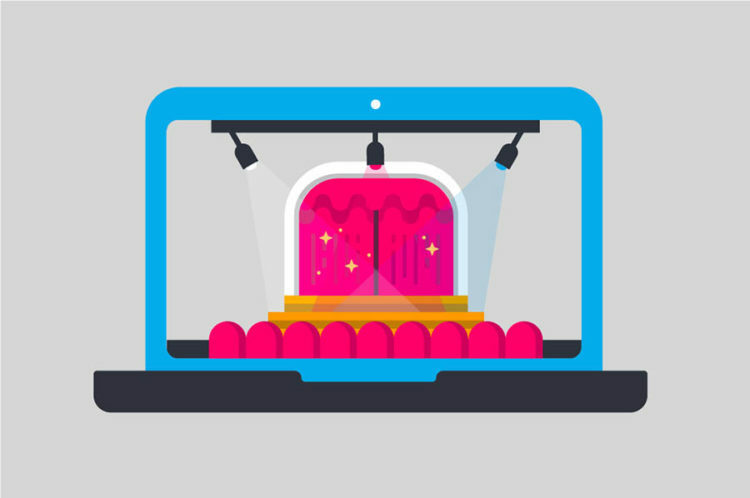 For now, let’s look at how to create a staging site with WP Staging. You’ll first need to install and activate the plugin within WordPress on the site you want to copy. Then, a new WP Staging tab will appear on your dashboard. Click on Create a new staging site, and you’ll be able to give it a name. You’ll also see some other options. DB Tables will enable you to exclude copying certain data. However, in most cases you’ll want to copy everything — so you can ignore this section. The same is true for Files, which offers advanced customization options you aren’t likely to need at this point. Instead, select the Start Cloning button. The plugin will take a little while to do its thing. Meanwhile, you’ll see a few progress bars that let you know it’s still working. When the process is complete, you’ll see a success message, and be provided with a link to your new staging site. You can either click on the link or the Open staging site button to visit it, using your regular credentials to log in. We’d recommend taking a little time at this point to explore your staging site, making sure everything has been copied over correctly. 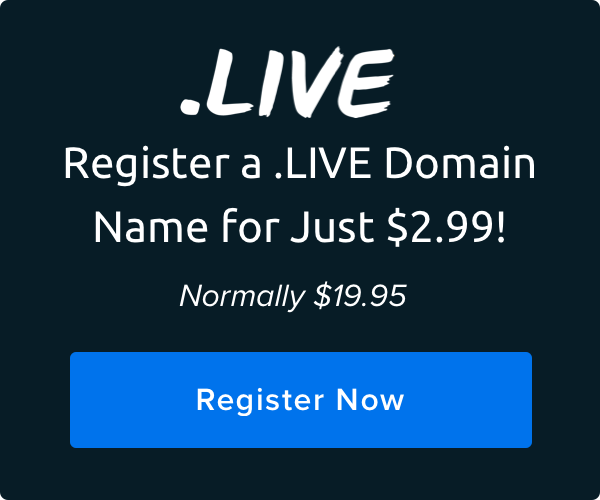 It should be a perfect duplicate of your live site. As long as everything looks in order, you can now start using it to perform experiments, test out new plugins or themes, and conduct troubleshooting. What if you make changes to your staging site, and want to put them in place on your live site? You could make the alterations manually to both sites. However, it can be far easier to tweak your staging site until it’s just right, then copy those changes over to the real version. You can do this with WP Staging as well, although you’ll need to purchase the plugin’s premium version. This isn’t exactly a cheap solution since it will cost you $69 for one site, but it can be worth the investment if you plan to make frequent use of your staging site. If you do opt for WP Staging Pro, you can follow the developers’ handy tutorial for pushing changes to your live site. Finally, it’s worth mentioning that if you only want to create a new WordPress site for testing and experimentation, and don’t need it to be a copy of a different site or intend to make it live, there’s another option. You can create a local WordPress website, stored on your local machine. This way, you can work with your staging site offline, and no one will be able to access it unless they’re using your computer. You can use a tool such as XAMPP (for Windows users) or MAMP (for Mac users) to create one or more local sites quickly. If you want, you can also use these solutions to copy and push changes to your live site, but the process is more involved than the methods we’ve outlined above. Until you have a little more technical experience under your belt, we’d recommend sticking with one of those instead. Regardless of which method you use, in the end, you’ll have a shiny new staging site ready to go. Before you start working with it in earnest, however, there are a few initial steps you’ll want to take. First, if you’ve copied over your live site, go through your staging site and make sure everything has been transferred correctly. Make sure content is formatted the right way, images and other media are appearing, key features are working, and so on. In your WordPress dashboard, navigate to Settings > Reading, and check the box labeled Discourage search engines from indexing this site. This will help ensure that no one can stumble across your site if it’s hosted online. While still in your dashboard, go to Settings > Permalinks. Make sure that the staging site’s permalink structure is set up correctly (in other words, that it’s the same as your live site). Otherwise, you can end up seeing 404 errors. After that, you should be set up and ready to go. Before we wrap up, however, it’s worth noting that there are other options for more advanced users. GitHub and BitBucket, for example, are services developers use to share and collaborate on projects (for example, when creating websites, themes, and plugins). They can also be used to keep track of the changes to your staging site, and even share them with others to get help and feedback. If you’re interested in learning more about these tools and how they can help you build websites, there are plenty of guides you can check out that will get you started. Creating a staging website is a smart way to simplify the ongoing maintenance of your live site. Having a copy of your live site hosted on your local computer enables you test changes and fixes in a safe environment. Plus, there’s no chance you’ll bring down your live site in the process or break features. Do you have any questions about staging sites, and how to use them? Connect with us in the DreamHost Community and ask us anything!